Naples' Cote d'Azur has Provence-style French food in a pleasant homey atmosphere within, despite being in a Publix anchored strip mall on the NE corner of Immokalee and US41. 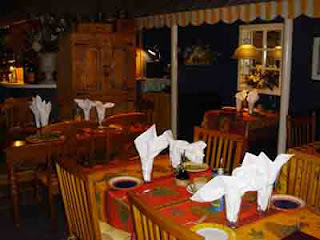 One is greeted and seated in the long narrow restaurant with its charming décor. White PVC columns support yellow and white striped awnings over the booths. The tables are decorated with yellow and orange tablecloths-I prefer a booth. The blue walls are accented by mirrored “windows” for a nice touch. Most visitors choose to eat inside, passing on having a symphony of clattering shopping carts and parking lot noises. We started on complimentary bread and a nicely balanced balsamic vinegar/oil/spice mixture-a tasty treat. There are 6 salads for those on diets, and other appetizers include Mussels Marinieres, Crabcake, and Fried Calamari. The entreès are smaller and, unnecessarily for the diner, more expensive than at the more popular French restaurants in Naples (i.e. Bamboo Café, Chardonnay or Escargot 41; Bleu Provence's prices are still overall less.). The, ahem, "cheapest"- is the $28 chicken breast, with ALL the other entrées well up in the $30's. Most specials are over $40. 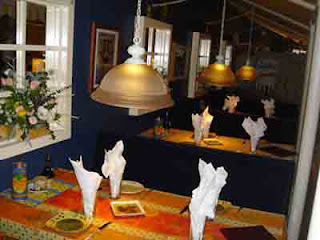 Increased prices sadly do not parallel any obvious increase in quality over the other restaurants. Comparable restaurants from Naples to Fort Myers have most entrees around $19-29. Do ask the price of the specials before ordering, or you will have quite a surprise later. Try Veal Scalopinne or (lollipop) Lambchops for $35, or Beef Ribeye or Filet Mignon for $36, or Veal Chop for $37. We enjoyed the Roasted Lobster in Clay Pot with Root Vegetables ($36) (photo below) and the lollipop Lamb Chops with Rosemary, Thyme, and a Pinot Noir Reduction ($35)(photo below). Wine by the glass starts at $9, with most cocktails at $15. Share a bottle? There are a dozen white wines starting at $36 per bottle, 39 reds starting at $36, and 4 champagnes starting at $120. Ouch. Bring you own special bottle? Corkage fee is $35. Desserts include Poached Pear, Poached Fig, Crème Brulee, and two Sorbets. We shared a Chocolate Truffle Cake, and found it lusciously oozing with rich chocolate sauce. Midwesterners seem to prefer Cote d'Azur's cuisine and sauces. Native French and Northeasterners prefer the other places I named. Let price, location and your tastebuds guide you, and I believe you'll be satisfied at this, or at most of the other French restaurants. 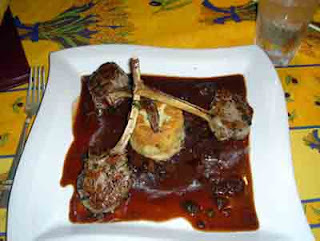 Cote d'Azur- 11224 Tamiami Trail North, Naples, 239-597-8867. I am a French native and I don't see any reason to waste my money at Blue provence and others that you named. No comperison. 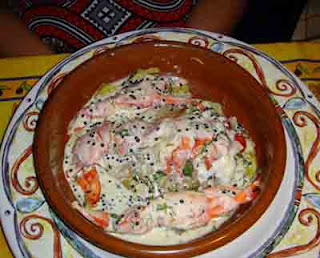 I strongly recommend Cote D' Azur restaurant to every reader of this blog. Bon Apetit!